We get regular questions related to the NEXUS card. We decided to dedicate a post to explaining what the NEXUS program and card are about. If you’ve ever crossed the American/Canadian border, you’ve probably seen the lane for NEXUS card holders. You may have also seen NEXUS terminals at an airport. The NEXUS card is an alternative method of crossing the border – also fulfilling the requirements of the Western Hemisphere Travel Initiative. It’s ideal for those of us who regularly travel between nations or for those who commute between the United States and Canada for work. 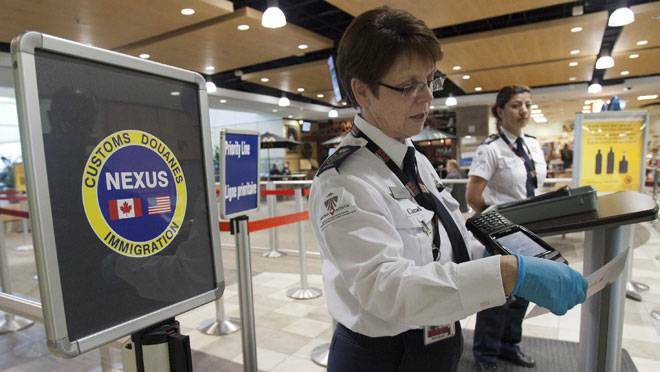 The NEXUS card program is a partnership between the Canada and U.S. border services, but NEXUS cards are issued by U.S. Customs and Border Protection (CBP). The program was created to streamline customs and immigration clearance for pre-screened, low-risk, frequent travelers. The card proves identity and citizenship and thereby acts as a substitute for a passport for entry into Canada for U.S. citizens (and vice versa). Anyone can apply for a NEXUS card, however, you must be interviewed and need to qualify. NEXUS card holders are identified at land border crossings by presenting their cards for scanning and at airport kiosks by undergoing a biometric securtiy check – a retinal recognition scan. With that said, not all airports accommodate NEXUS card holders. The NEXUS card is NOT meant to replace a Canadian passport. It is also NOT a replacement for your passport. It grants you no special privileges. Technically, even if you carry a NEXUS card – even though you won’t be asked for your passport at a U.S. border – you still need to have it with you. You cannot travel internationally with a NEXUS card. It is meant only to facilitate entry and reentry between the United States and Canada. what should I DO TO get my Nexas card back?? ?